We’ve shared dorms with some great people as well as some not so great people over the last couple of months, but I think last night, we shared our dorm with probably the worst kind of person – someone with sleep apnoea! Just before we went to bed, one of the guy’s we were sharing our dorm with was huffing and puffing whilst getting ready for bed. He was middle aged and relatively big. Also he was wearing a suit so I’m guessing he probably works in BA but not sure why he’s staying in a hostel of all places?! Anyway, from the way that he was moving, we could tell he was definitely going to be a snorer. In the end, he was worse! He had the loudest snores in the world! I am not exaggerating! Coupled with his sleep apnoea, I was being startled throughout the night. He would snore maybe 5 or 6 times then stop breathing for about 30 seconds, by then you’ve almost fallen back to sleep, then off he goes again. Or when he stops breathing for a longer time, the thought of death crosses your mind. Maybe his wife’s kicked him out of the house as she can’t sleep with him so that’s why he’s staying in a hostel – likely story? Anyway, after eating the free breakfast of toast and tea, we packed up and headed to Hostel Ostinatto where we got a 10% for paying upfront for 9 days. The hostel is located in San Telmo, a popular backpackers district in the city. We checked into a 12 bed dorm. The dorms were really nice and comfortable and fairly spacious. It had its own bathrooms too which were very clean. In the evening, we finally decided to try what everyone goes to Argentina for (provided that you are not a vegetarian) – steak! We had been putting it off since we’ve arrived in the country as we wanted to wait till we were in the capital. We found a restaurant nearby called Don Ernesto which was highly rated on Tripadvisor. Arriving at the restaurant at 9pm, it was still too early to go in so we popped into a bar nearby for a quick drink before our meal. By 10.30pm the restaurant was really filling up but we managed to get a table without waiting too long. I ordered the bife de chorizo (sirloin steak) rare whilst John ordered a bife de lomo (fillet steak). We also shared a bottle of red wine, portion of chips and a salad. When the steak arrived, mine was the size of my face! It was so big and juicy! I couldn’t believe it! When I cut into it, the juice and blood ran riot across my plate! It was so tasty but probably a little too rare for my liking but it was still the best steak of my life! Wow! 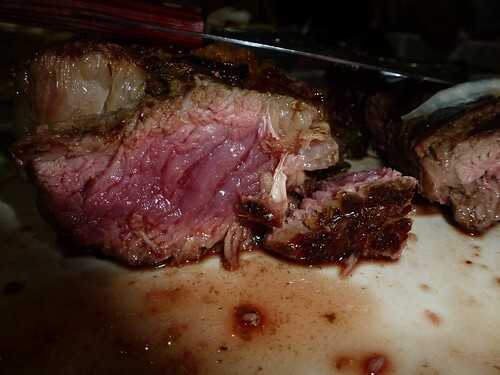 John’s was also very tasty and his was perfect having ordered a medium steak. I could only manage about half of mine and John had the rest along with his own!! What a beast! But its better than wasting it. Best meal so far on our trip! The bill came to around £25, What a bargain! A meal like that in England would cost in the region of £80-£100 if not more! This entry was posted in Argentina, Food and tagged food, meat, seak. Bookmark the permalink. ← Day 54 – Hola Buenos Aires! 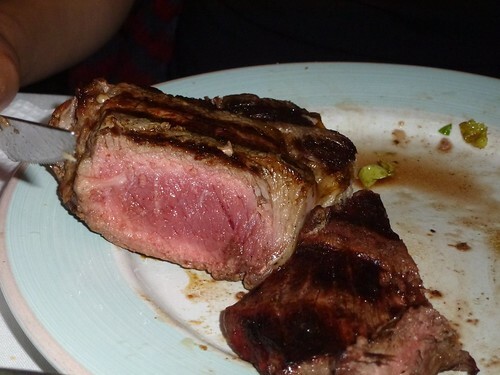 2 Responses to "Day 55 – The best steak in Argentina"